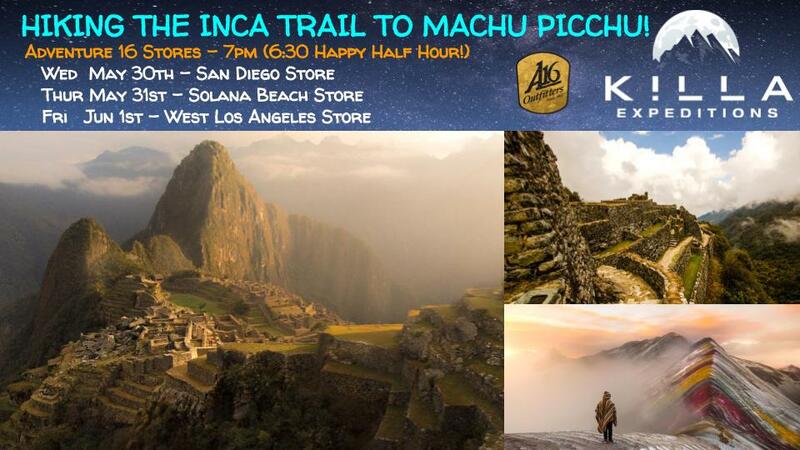 Hike the Inca Trail to Machu Picchu: Join our free A16 Talks May/Jun 2018! 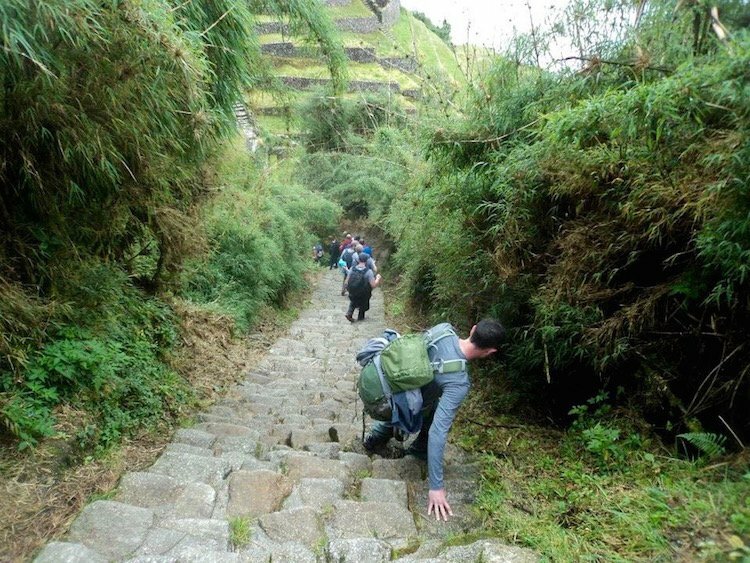 Is the Inca Trail Trek to Machu Picchu on your bucket list? Join Jose Montes of Killa Expeditions here in Southern California at the awesome Adventure 16 Stores this May/June! Enjoy his inspiring talk about hiking the classic Inca Trail to Machu Picchu. He will discuss some local history, Inca culture, as well as logistics around booking this famous, much sought-after trek. Also highlighted will be beautiful Machu Picchu, as well as three off-the-beaten-path treks (Rainbow Mountain Trek, Choquequirao Trek, and Ancascocha Trek). Don’t miss this opportunity to plan your 2019 trip to Peru (or even a last minute 2018 trip)! Permits are already sold out through October 2018! Click here to book your spot on this famous trail for late this year or reserve your spot for 2019! Talks start at 7pm but arrive at 6:30 for a fun & yummy Happy Half Hour courtesy of Exofficio, Eagle Creek, and Helix Brewing Co! Click here to visit the Adventure16 Event Page for more info! The Inca Trail is the most famous hike to the incredible ruin site Machu Picchu. Although there are more than 40,000kms of trails built by the Incas during their reign of South America, this one trail is the most well known because it culminates at the Sun Gate, the original Incan entrance to Machu Picchu, on the fourth day of the trek. You get to experience entering the archeological site just as the ancient Incas did. As if that wasn’t enough, you also explore 7 small Inca Ruin sites, see snow-capped mountains, view beautiful flora and fauna and hike 42km/26 miles along the way. Be aware that this trail is very busy can feel nose-to-tail on several portions, and have crowded/loud campsites. 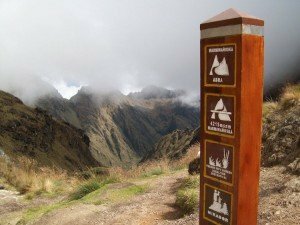 The classic 4 day Inca Trail requires permits and they book up fast – so if you have your heart set on this trail you’ll need to book your permits through an approved tour operator at least 6 months in advance! The Rainbow Mountain Trek is of the most spectacular, and new, off-the-beaten-path multi-day treks in the Andean mountains. Just four hours outside of Cusco Peru, this trail is breath-taking the entire way. Be prepared to be awed by snow-capped mountains, glacial peaks, never-ending mountain vistas, traditional villages, hot springs, and the beautiful striated rainbow mountains! You’ll also see llamas, alpacas, chinchillas, and maybe even vicuña and condors if you’re lucky. Because it’s a remote trail you won’t run into too many other trekkers. This is true pristine wilderness camping at it’s best. At 52km/32.3miles, with summits up to 5200m/17,060ft this trail is not for the couch potato. The best time to go is between March and November and is a true adventurer’s dream. Click Here to Book the Epic Rainbow Mountains Trek! 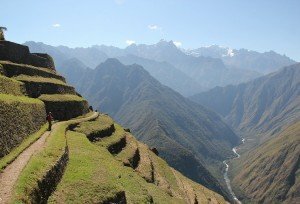 If you want to make this unique trail your next travel adventure, we offer packages with and without Machu Picchu. Our 6 Day Rainbow Trek Package includes 4 days of high altitude hiking, 3 nights of camping in 4 season Mountain Hardwear tents, an overnight in a hotel and celebratory dinner in Cusco on night 4, a beautiful tour of Maras, Moray & Salineras on day 5, an overnight in a hotel and dinner in Aguas Calientes on night 5 and of course an inspiring tour of Machu Picchu on day 6! Talk about epic! We also offer a 9-day package that includes the entire Ausangate Loop and the Rainbow Mountains! Check out our treks & tours to Machu Picchu here! If you found this information helpful, please refer to posts about Winter Solstice and read about the best time to visit Machu Picchu. Killa Expeditions is passionate about providing exceptional & sustainable adventure eco-travel experiences, encouraging people to explore off the beaten path, and inspiring others to give back. To book an adventure of a lifetime, contact us today!